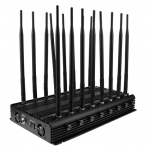 Adjustable 16 Band Jammer CPJX16 designed to block all wireless Networks including ALL 2G,3G,4G cellular bands Lojack 173Mhz .433Mhz,315Mhz GPS,Wi-Fi,VHF ,UHF ,iDen, TDMA,CDMA, GSM, UMTS, DCS, PHS, PCS, 3G, 4Glte,4G Wimax ,AMPS, N-AMPS, NMT, TACS. Telephones or other electronic communication devices in the vicinity of CPJ-X16 product will be unable to receive signals or in the case of a mobile phone, dial outgoingcalls. The jamming Radius (50-80) meters@-75dBm still dependson the strength signal in given area. The shielding radius of VHF/UHF signal should be less than cell phone signal. the CPJ-X16 Series that fits the appropriate commercial or institutional application. adjustable 16Band Jammer model#CPJX16 All in one ! The Models Works in all countries and jamming for all 2G,3G,4G celluars phones ,Wi-Fi/Bluetooth,remote control433,315,868Mhz,gps,lojack wireless device.